After a few days at my parents that included the annual Boy’s Night with the best wings in Chicago and a baseball game at US Cellular Field plus a couple days heavy beer drinking at the annual Ashkum Homecoming, it was time to spend a few days with J’s parents. On Monday, J wanted to make a run to Babies ‘R Us but not before finding something for lunch. No one was really coming up with any good ideas and eventually J threw out one of her staples from her high school days. The Oak Lawn Family Restaurant is in downtown Oak Lawn on the very busy W. 95th Street. The building butts right up to the road so parking is in a small lot along the side as well as a larger lot around back. The restaurant probably hasn’t changed much in the fifty plus years of its existence. It’s a classic family diner with (by today’s standards) cheesy, dated decor. We were taken to a booth in the back dining room. We asked for a high chair for L and what the bus boy brought out was this really cool seat that attaches to the table. I’m really tempted to buy one of these things. L sat next to me at the table on the inside of the booth and looked like such a big girl. The menu is huge and breakfast is served all day. That makes deciding on a meal even harder. I glazed over the breakfast menu, but ended up on a burger…like I usually do. My choice was the All-American Burger. 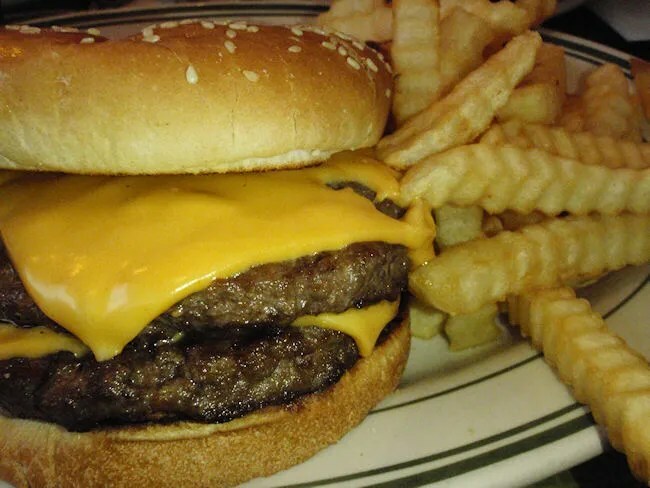 The two freshly ground meat patties are served on a sesame seed bun with melted cheese in between the layers, lettuce and tomato. I ordered the sandwich deluxe which gets me fries and soup. I passed on the soup and just got the fries. For a diner sandwich with no expectations, this burger was really good. It was one of those burgers that you just don’t expect. The fresh meat is cooked a little longer than I would normally like, but the fresh over frozen aspects keeps it juicy. The fries that come with the sandwich are pretty standard crinkle cut fries, but crispy and delicious. J stuck with her old standby as well by ordering the Grilled Cheese. Not much of a surprise with this one. 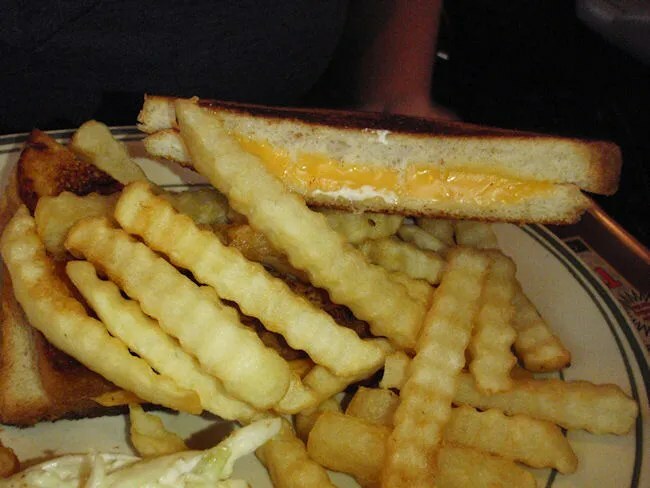 It’s a pretty standard grilled cheese on white bread. She also ordered Deluxe and also passed on the soup. Since I’m writing this almost a week later, I totally forgot what J’s mom ordered. I could take a few guesses by looking at the menu, but that wouldn’t do anyone any good. The bill for the three of us was a little over $35. 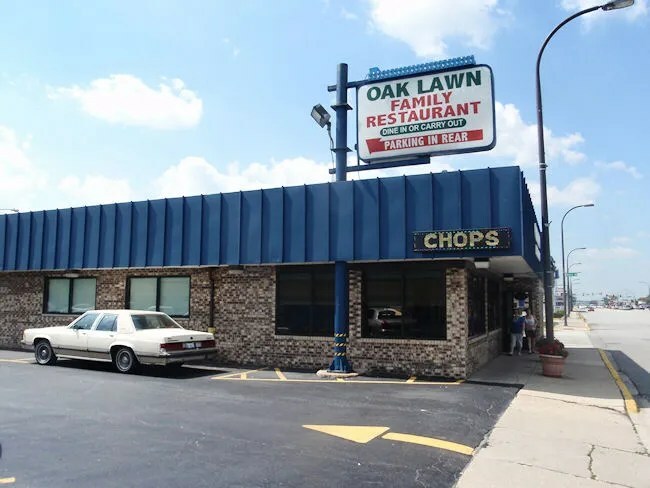 Since J and I have been making the trip back to Chicago well after midnight, we have always talked about hitting up the Oak Lawn Family Restaurant. They’re one of two 24 Hour Family Diners not far from J’s parents house. There’s a little bit of nostalgia for her in the place as the restaurant just down the street from Oak Lawn Community High School where J went to school. She spent many hours at the place before and after school and school activities, but hasn’t been back in some time. Our meal was a little better than I was expecting from the place. It’s a solid family restaurant with a huge menu.